Many of you asked for it, so I've finally done it! 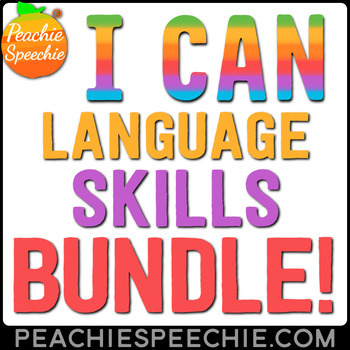 I've BUNDLED my I Can... language skills workbooks! These workbooks start out with basic introductions of the concepts and gradually increase in difficulty. Perfect for differentiation in classroom groups or progressing in speech therapy sessions! High quality illustrations help explain the concepts in each book. View the individual product descriptions for a detailed look at what is included. Note: This bundle includes my language skills I Can... workbooks. If you are looking for the I Can Say... Articulation Workbooks Bundle for speech therapy, that can be purchased separately.